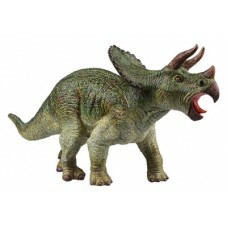 Museum quality, accurately designed replica of a triceratops dinosaur. Made of soft PVC with synthetic fibre filling making it light for children to play with. Measures approximately 24cm long x 12cm tall. Ideal for both collectors and young children.